BAE Systems has revealed their new generation flagship space computer that combines fast performance and extreme resiliency to enable previously impossible missions in the harsh environment of space. 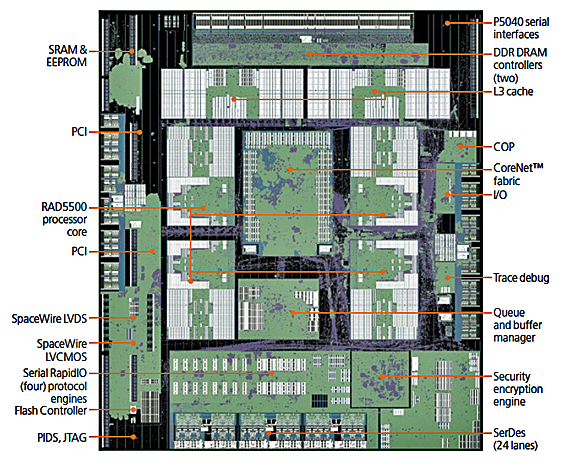 BAE Systems' RAD5545™ multi-core system-onchip Power Architecture® processor. The new RAD5545™ single-board computer (SBC) provides next-generation spacecraft with the high-performance onboard processing capacity needed to support future space missions — from weather and planetary exploration to communications, surveillance, tracking, and national security missions. The RAD5545 SBC delivers exponential improvements in size, speed, and power-efficiency over its proven predecessor, the RAD750® SBC. According to Dave Rea, Director of On-board Processing and Advanced Technology at BAE Systems, the company has been delivering radiation-hardened components for almost three decades and customers have come to trust the performance, reliability, and longevity of BAE technology. The RAD5545 SBC is the next step in the evolution of space computers and is the most technologically advanced radiation-hardened, general-purpose processor for space applications.